Apparently someone forgot to tell Trump that being president of the United States is the toughest, most scrutinized job on the planet, and that criticism of his performance is often fast and furious. It simply comes with the proverbial territory. Especially when he lies and manufactures magazine covers. Trump has intense disdain and disgust for our free and open press. He believes the media is an extension of his PR team, and when they fail to perform and instead do their jobs as independent journalists, as did Brzezinski, they reap the merciless wrath of the Manbaby-in-Chief. And his vengeful behavior is particularly savage towards women. Trump clearly has a serious issue with women and, in particular, their physical appearance. His history of viciously attacking women on personal attributes goes backs decades. Victims of his sexist/misogynist rants include Meryl Streep, Megyn Kelly, Cher, Rosie O’Donnell, Anne Hathaway, Angelina Jolie, 1996 Miss Universe Alicia Machado, Heidi Klum, Gold Star mother Ghazala Khan, Justice Ruth Bader Ginsburg, Carly Fiorina, Elizabeth Warren, Arianna Huffington and, of course, Hillary Clinton. 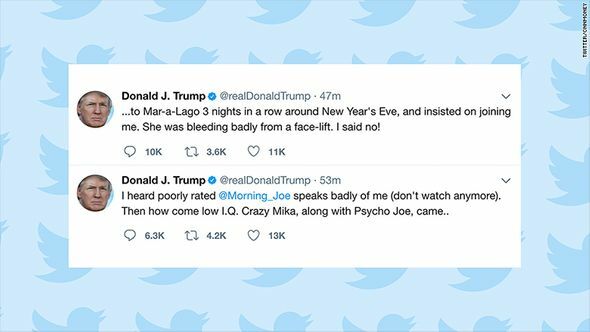 During unhinged fits of insecurity and anger Trump’s referred to women in the most derogatory terms. Fat, pig, slob, bimbo, dog are just a sampling of the unconscionable insults he’s hurled their way when he’s felt challenged, criticized and threatened on policy matters. And it doesn’t take much to set him off. “Trump is so easily played,” Brzezinski said Friday morning. That’s a ginormous understatement. But it raises the question of just how Trump will react if, rather than a morning cable TV host, his buttons get pushed by a dangerous enemy such as Kim Jong Un, Bashir al-Assad or Vladimir Putin. Will he use the bully pulpit, and U.S. military, to start a deadly war of words or worse? Will the unfiltered, unfit, unglued, undisciplined Trump put the safety and lives of Americans in peril because his rapacious, out-of-control raging ego is again bruised? 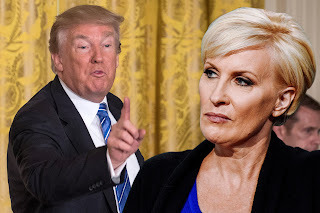 "He was vicious when he turned from you (Scarborough) to Mika. His face was red. He started talking about blood coming out of her ears, out of her eyes." Let me take this conclusion further: Donald Trump is not mentally equipped to be president.